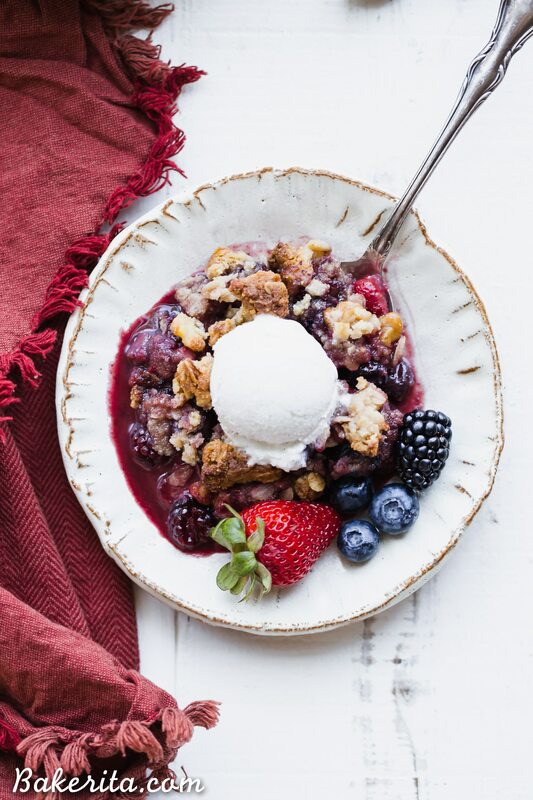 This Mixed Berry Crisp uses a mix of your favorite berries and is topped with a crunchy oatmeal crisp topping. This flavorful dessert is gluten-free, vegan, and best served with some dairy-free ice cream or coconut whipped cream! Crisps are some of my FAVE desserts ever – apple crisp used to be my die-hard fave, but since I’ve been swimming in ALL sorts of treats for the last seven years, it feels unfair to declare an all-time favorite. Crisps will always hold a special place in my heart though…it’s hard to resist the combination of warm fruit and a crunchy crumble topping, especially when it’s got some dairy-free ice cream or coconut cream on top. The hot/cool combo is pure perfection. 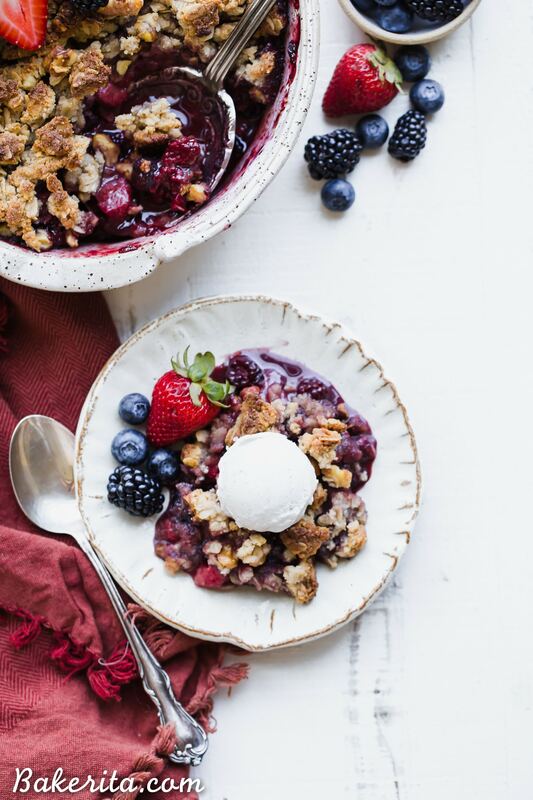 This berry crisp totally embodies all of that goodness! 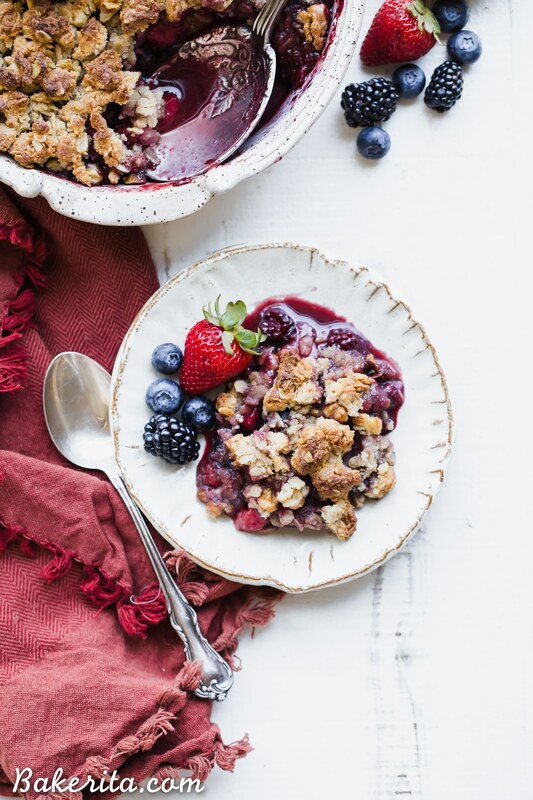 With all the beautifully sweet and vibrant fresh berries around during these hot summer days, this makes the perfect dessert for this time of year. 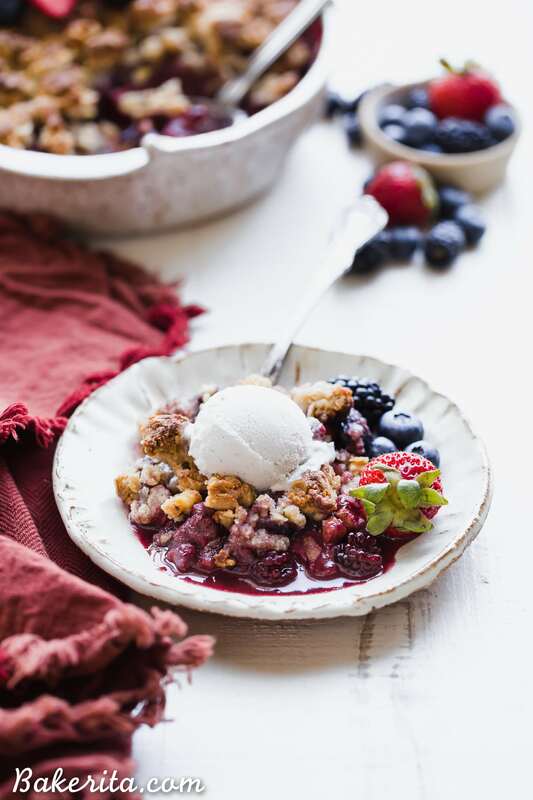 The berry filling is super simple – it’s a combination of your favorite berries tossed with tapioca flour to thicken, coconut sugar to sweeten, and cinnamon and vanilla for flavor. I used blueberries, strawberries, blackberries, and raspberries, but you can use any or all of them. 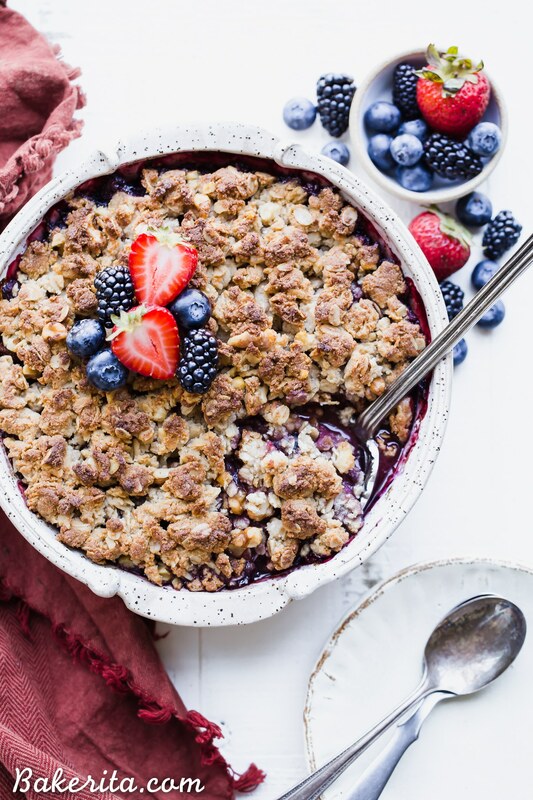 The crumble topping is equally as easy to put together – some almond flour, coconut flour, cinnamon, and gluten-free rolled oats come together, and then some maple syrup and coconut oil are mixed in until crumbly. I added some walnuts for crunch, too! Pile it all together in a baking dish and bake until bubbly and golden and your house smells like pure DELICIOUSNESS – then you’re ready to serve! :) Simple is the best, isn’t it?! This is perfect for the 4th of July (just use those red & blue berries and don’t forget the ice cream for the white ) or literally ANY other day of the summer/year. You can even use frozen fruit, just make sure to defrost before using or it won’t thicken up properly and will be a little runny. Hope you love this one as much as I do! Hard to go wrong with a simple crisp, right?! Enjoy, my beautiful friends! Preheat the oven to 350°F. Lightly grease a 9” square or round casserole dish with coconut oil. Set aside. Place the mixed berries in a large bowl. Add the tapioca flour, coconut sugar, cinnamon, and vanilla extract. Toss to coat all of the berries and pour into the prepared pan. For the crumble topping, combine the almond flour, coconut flour, cinnamon, rolled oats, maple syrup, coconut oil, and walnuts in a mixing bowl. Stir until the dry ingredients are completely moistened and then crumble evenly over the berries. Place the pie on a baking sheet and bake 45-50 minutes or until the crisp is bubbling, and the crumble is golden brown on top. Tent with foil if the pie starts to brown too quickly! Serve warm or let cool before serving. I recommend serving with dairy-free vanilla ice cream or whipped coconut cream. Keep any leftovers stored in the refrigerator. Curious what you might recommend to replace the oats? Maybe Flax seed meal? Or??? Love your thoughts as I’m avoiding oats. Thanks! Soooo absolutely delicious! Will be making again! Probably tomorrow for breakfast!! So thrilled you’re loving it Lindsay! Just made this with blueberries & raspberries and it was so great! 5 stars, thanks for the recipe. So thrilled you’re loving it! Thanks for the feedback, Danielle.